D. iii 14-15; A ii 46-52; P I 15-17; V I 6 (Talwar and Jhingran, 1991). 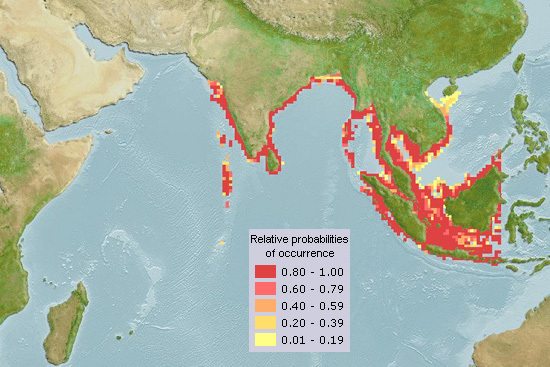 Aquamaps (2014) Computer Generated Native Distribution Map for Ilisha megaloptera (Bigeye ilisha) (modelled future range map based on IPCC A2 emissions scenario). www.aquamaps.org, version of Aug. 2013. Web. Accessed 12 Sep. 2014. Cuvier G and Valenciennes A (1847) Histoire naturelle des poissons. Tome dix-neuvième. Suite du livre dix-neuvième. Brochets ou Lucioïdes. Livre vingtième. De quelques familles de Malacoptérygiens, intermédiaires entre les Brochets et les Clupes. Histoire naturelle des poissons. 19: i-xix + 1-544 + 6 pp., Pls. 554-590. Huda MS, Haque ME, Babul AS and Shil NC (ed.) (2003) Field guide to finfishes of Sundarban, Aquatic resources division, Sundarban, Boyra, Khulna, Bangladesh, p. 65. Rahman AKA (1989) Freshwater Fishes of Bangladesh, 1st edition, Zoological Society of Bangladesh, Department of Zoology, University of Dhaka, Dhaka-1000, pp. 253-254. Rahman AKA (2005) Freshwater Fishes of Bangladesh, 2nd edition, Zoological Society of Bangladesh, Department of Zoology, University of Dhaka, Dhaka-1000, pp. 277 -278. Siddiqui KU, Islam MA, Kabir SMH, Ahmad ATA, Rahman AKA, Haque EU, Ahmed ZU, Begum ZNT, Hasan MA, Khondker M and Rahman MM (eds) (2007) Encyclopedia of Flora and Fauna of Bangladesh, Vol. 23. Freshwter Fishes. Asiatic Society of Bangladesh, Dhaka. p. 17. Talwar PK and Jhingran AG (1991) Inland Fishes of India and Adjacent Countries,Vol. 1, Oxford & IBH Publishing Co. Pvt. Ltd. New Delhi-Calcutta, pp. 119-120. Younis, K.H. (2000) The biology of Ilisha megalopetra in Shatt Al-Arab estuary N/W Arabian Gulf. Marina Mesopotamica 15 (1): 169-181. Visited 268 times, 1 visits today | Have any fisheries relevant question?